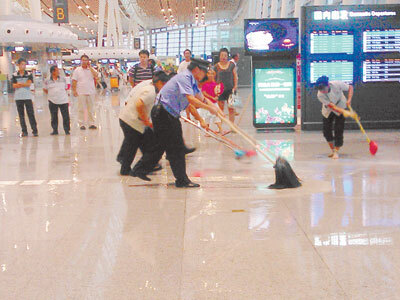 A rainstorm that hit Changsha, Hunan, has brought into doubt the construction quality of the city's newly-opened airport terminal as photos of flooded floors appeared online, local newspaper Sanxiang Metropolis Daily reported on Monday. 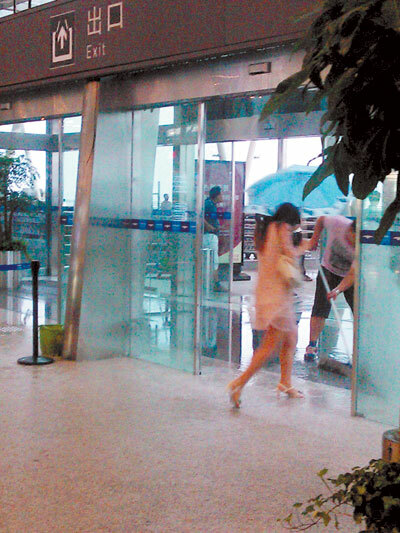 At the departure hall of Terminal 2 of Changsha Huanghua Airport, which has been in use for only about 13 days, passengers needed to walk through a "waterfall" at the exit to the outside, said the report, quoting posts on microblogs. But an unnamed airport staff member told the reporter that though there was floodwater in Terminal 2, it was not due to the poor design or lax construction of the terminal, the report said. "The rains came through the exit door and the rain was so heavy that it couldn't be tunneled out immediately." The sudden storm, which started at around 4.40 pm in the city on Monday, delayed or cancelled about 20 flights at the airport before services resumed two hours later.